Many talented musicians arrive at a new job to find that their institution is a facility populated with pianos in poor condition that are barely serviceable. The second surprise is that they find themselves in charge of the management of the maintenance of these instruments. In this position, the initial step would be to contact the piano technician or local dealer who has been servicing the pianos to review the inventory of instruments and receive recommendations for care or disposal. An unbiased appraisal of the condition of the instruments is necessary for a plan to maintain and improve the usability of the institution’s pianos. 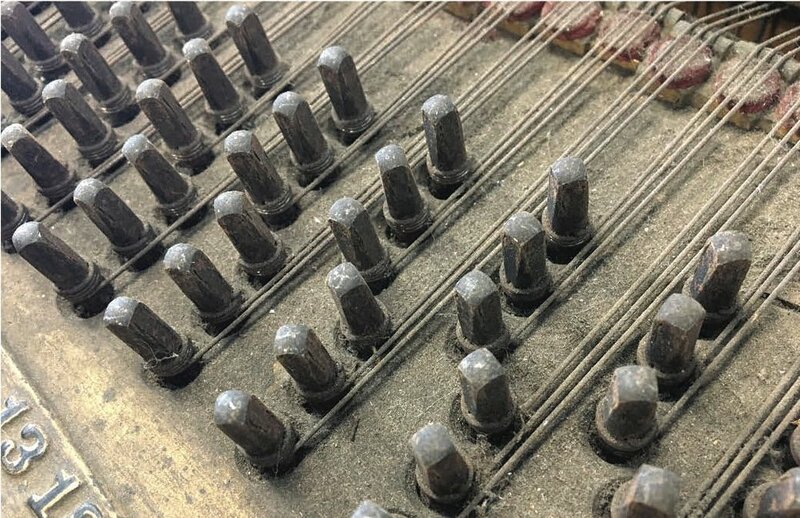 Many pianos in institutions or churches have similar issues resulting from inconsistent heat and humidity conditions, lack of servicing, or age-related mechanical failure. Pianos in churches or concert halls that have the heat or air conditioning turned down or off during the week suffer the most from tuning stability issues. Recently, I tuned a piano in a hall at a university. The stage manager explained in detail how careful they were with the temperature and humidity conditions of their hall and how they stored the piano in a box-type storage room at the back of the stage. As he left he cautioned me to hurry and get the work done before 5 P.M., because the “air goes off then.” Sadly, this of course, counteracts any effort to maintain conditions for the piano during use. Many institutions keep pianos in a storage box built to preserve the condition of the piano. This will work to keep unwanted players from using it, but will do little to maintain the tuning or regulation, especially if the box is humidity-controlled and the hall is not or vice versa. As soon as you take the piano out of the box, the conditions change enough to make the tuning unstable. The box idea is useful in multiuse facilities but consistent tuning is the only answer to stability unless conditions are carefully controlled between the storage area and the hall. The good news is that pianos were invented prior to central heat and air conditioning. The construction of a performance- grade instrument is designed to withstand reasonable changes in humidity with the pitch dropping flat in cold weather months due to heating and rising sharp in the summer because of higher humidity. If the temperature is constant and the humidity is somewhere between 40 and 60 percent the piano should withstand the small changes from season to season. When manufacturers offer the 40- to 60-percent guidelines they are not expecting the humidity to swing 20 percent in either direction. They are suggesting that the facility pick a number (i.e., 50 percent) between those levels and try to stay there. It is the rare facility outside of museums or high-level concert halls that can achieve this type of consistency. As a result, tuning needs to be more frequent to maintain pitch. In theory, a tuning every change of season is recommended for most pianos. In high-use situations, pianos are tuned every day or even twice a day for concert and recording work. In most churches, four to six times a year with extra tunings for special occasions is the norm if the piano is expected to stay at pitch. If it must consistently match an organ, it will have to be tuned at least once a month. When pianos move decidedly sharp or flat from rapid sudden humidity changes, the tuner will have to do a pitch correction prior to a tuning to get the piano to hold tune. Drastic changes in pitch usually result in very unstable tuning and it will take several tunings to get the piano back to normal. This means that on a stormy Sunday with the doors opening and closing frequently or being propped open at the beginning or end of a service, one should expect the piano to move considerably in pitch in a matter of an hour. Occasionally you will hear the piano technician say that something is cracked in the piano. The term “cracked” when referring to piano parts needs to be clarified to assess the level of severity. • Cracked soundboard. This is very common in older pianos and sometimes causes buzzing on specific notes. However, in many cases cracked soundboards go unnoticed because it usually does not influence the sound. Many cracked soundboards can be easily repaired, but unless there are other problems with the board, these repairs are usually cosmetic. Occasionally the soundboard will have to be replaced because of lack of crown, the upward curvature of the soundboard. The loss of crown can be present with or without cracks. • Cracked pinblock. The pinblock holds the tuning pins tightly so that the piano can be tuned. This is repairable if the piano is worth the cost of the repairs. A new pinblock can be installed when the strings are replaced. The pinblock cannot be replaced unless all the strings are removed. Restringing will always be a part of the cost of pinblock replacement. • Cracked cast-iron plate. This is the metal structure (harp) that holds the strings above the soundboard and is usually painted gold. This unfortunately is a permanent and irreversible problem, but it is a rare occurrence. Although some technicians have successfully welded them, in general this is not possible and one cannot tell if it will hold until the piano is strung and brought back up to pitch. This is a very expensive risk that most institutions are reluctant to take. Replacement plates are available for Steinways if they are sent back to the factory and the model in question is still in production. • The tuning pins are loose and when the tuner corrects the pitch, the pins slip in the hole, putting it immediately out of tune. This can be a minor problem of oversized tuning pin holes, but is normally a cracked pinblock whose laminations have lost the required pin torque or tightness to keep the strings in tune. This can be repaired but the cost may well exceed the value of the instrument. • The strings are worn out. Even if the tuning pins are still tight, the strings deteriorate from metal fatigue. This can happen even if there is no obvious rust or discoloration. The technician will tell you that the piano needs to be restrung because the strings cannot be accurately tuned. This is a subtler change that happens gradually over time, but a tinny sound, short sustain, and false beating of strings are evident, which cause the piano to never sound in tune. This deterioration will eventually occur with every string but is more common in pianos that are played very loudly with fast, repeated notes. Concert pianos that are used for high-level concert and recording work are restrung about every five years to keep them tunable. • The manufacturer of the piano is out of business and there are no parts readily available for repairs. Replacement is not completely impossible but the technician will have to use off-the-shelf parts that will have to be modified to function correctly. There are thousands of parts in a piano action and the hours involved to do this precisely will be very costly in terms of technician time. This is especially true for older spinets, consoles, and Asian pianos. Japanese pianos not made for the American market, referred to as the “gray market,” will also not have parts available for replacement. • The piano has not been serviced in many years. This often happens when a piano has been designated to go into a room where it has little use. A 60-year-old console or spinet that is well below pitch will be a nightmare to pull up to pitch even if the technician can achieve a temporary success. It may not hold tune and string breakage may be prevalent. Four or five tunings and spot string replacement as well as action repairs will exceed the price of a new digital piano. • Case parts are missing. If the music desk, pedal lyre, lids, or legs are missing, especially on 20th- or early 21st-century Asian pianos, the replacement parts are almost impossible to find. These companies sourced parts from many different small suppliers who either disappeared or quit making those parts as soon as their immediate contract expired. This is probably the most compelling reason to avoid off-brand instruments. Turn off all fans in the room. Fans create problems for the tuner in hearing the beat-rate speeds of the intervals being tuned. Try to avoid other activities in the sanctuary. This includes groups that will be talking, vacuuming, or doing maintenance, and frequent opening of doors to the outside. Any noise, especially voices, will interfere with the accuracy of the work being done. Please make sure the staff knows that the tuner is coming and that quiet is of utmost importance. Please remember to either leave lights on or to make sure someone is there that knows how to turn on lights above the piano. If your institution does get the opportunity to acquire a new instrument, make sure that appropriate funds are set aside for prompt tuning, service, and maintenance. Pianos have 12,000 parts and most of the moving parts are manufactured from wood, leather, cloth, and felt. The softer felt, cloth, and leather are there to make sure the action is quiet in use. These parts all pack down almost immediately with use and the piano will begin to feel heavy and unwieldy. This is because the change in dimension will subtly alter the regulation of the parts as well as the voicing of the hammers. Careful correction of these measurements is called “regulating the action.” This needs to be done within about six months of the purchase of the instrument to maintain the responsiveness of the action. If the regulation and voicing are carefully maintained when the piano is relatively new, the piano will settle out at the correct measurements making future servicing easier and less costly. Voicing the hammers is also very important to maintain the tonal quality. A little voicing, probably 10–15 minutes during each subsequent tuning service call, will keep the piano sounding new for many years. This voicing can simply maintain the sound or it can make the piano sound either bright or mellow. Crucial to the voicing is the correction of the hammer shape, more commonly known as filing the hammers. The hammers acquire string cuts in the surface. These widen over the years with the constant impact of the hammers to the strings. Having the technician very slightly sand the shoulder surface of the hammers more often will prolong the life of the hammers. Waiting too long for this service will accelerate the demise of the hammers. Not only will the tone suffer, but it will also necessitate the replacement sooner than expected. Knowledge of these needs will avoid the inevitable problem of having bought a new piano and finding that it does not sound like it did in the showroom at the point of purchase. These changes happen to all new pianos. Preparing the financial administrators in advance or negotiating this service into the purchase contract will avoid the surprise that often happens when the technician says that this service needs to be done to an almost new instrument. Finally, invest in a good padded cover for the piano and keep it covered when not in use. This is not just for the finish but also to keep dust out of the strings and action. Dust accumulation greatly accelerates the wear on the parts and the deterioration of the strings. Sally Phillips is the owner of Piano Perfect, LLC the Steinway Dealership in Columbus, Georgia. She has been active as a concert tuner/technician since 1976. She can be contacted at sally@pianoperfectllc.com or call her store at 706.221.9960. Tuning a piano is the process of adjusting the tension of its strings, thereby altering their pitch, or frequency of vibration, by slightly turning the tuning pins to which they’re attached, so that each string sounds pleasingly in harmony with every other string. This harmony is achieved by tuning the piano according to certain known acoustical laws and aesthetic rules and customs. To most piano buyers and owners, a piano's tone is probably its most important aspect, but also the most difficult to quantify or describe. Likewise, the shaping of the tone by the technician through the procedure known as voicing involves unfamiliar terminology, and techniques that are difficult for technicians to communicate to the customer. The purpose of this article, then, is to provide information about tone, voicing, and definitions of some commonly used terms so that piano owners and technicians can better communicate with each other, and piano shoppers can make more informed buying decisions. Regulation and voicing — the work of preparing a piano so that its touch and tone are even and beautiful — require a combination of painstaking technical adjustments and artistic considerations. Without this preparation, even the finest instrument is reduced to little more than a collection of parts, almost certain to disappoint. As a purchaser of a performance-quality piano, you have a much better chance of finding a suitable instrument if you have a basic understanding of these subjects.